The pial surface is a unique progenitor zone in the CNS that is receiving increasing attention. Herein, we detail a method for rapid genetic manipulation of this progenitor zone using a modified electroporation method. This procedure can be used for cellular and molecular investigations of cell lineages and signaling pathways involved in cell differentiation and to elucidate the fate and properties of daughter cells. Levy, R., Molina, J., Danielpour, M., Breunig, J. J. Neonatal Pial Surface Electroporation. J. Vis. Exp. (87), e51319, doi:10.3791/51319 (2014). Over the past several years the pial surface has been identified as a germinal niche of importance during embryonic, perinatal and adult neuro- and gliogenesis, including after injury. However, methods for genetically interrogating these progenitor populations and tracking their lineages had been limited owing to a lack of specificity or time consuming production of viruses. Thus, progress in this region has been relatively slow with only a handful of investigations of this location. Electroporation has been used for over a decade to study neural stem cell properties in the embryo, and more recently in the postnatal brain. Here we describe an efficient, rapid, and simple technique for the genetic manipulation of pial surface progenitors based on an adapted electroporation approach. Pial surface electroporation allows for facile genetic labeling and manipulation of these progenitors, thus representing a time-saving and economical approach for studying these cells. Neural stem and progenitor cells are present throughout the mammalian CNS1,2. Their nature and properties in embryonic and adult germinal zones surrounding the ventricular regions of the brain and spinal cord have been extensively documented in the past decade1-3. In large part, this has been due to the development of increasingly precise genetic tools, such as nervous system specific Cre recombination of floxed alleles or retroviral lineage tracing4. However, one progenitor region—the pial surface progenitor zone—has only recently been described in any detail5-7 and awaits comprehensive examination. The pial surface of the brain is defined as the interface between the surface of the brain and the surrounding meninges8. During development, neuroepithelial and, later, radial glial end feet attach to this surface9,10. Some of the first neurons in the human brain and many neuronal mitoses are observed in this region11. Later, during embryonic neurogenesis, cortical interneurons are known to traverse the pial region, in addition to their migratory routes in the intermediate zone and subventricular zone12-14. During this period, stem cells can be cultured from this zone and it appears to be an active site of neuro- and gliogenesis5. In the adult brain, it has been reported that interneurons can be born from pial surface progenitors following hypoxic challenge7. However, the contribution of this region to his to genensis during embryonic and postnatal development has remained obscure in part due to the difficulty of specifically investigating this region6. In the superior colliculus and in the cerebral cortex, superficial (or layer I in the cortex) interneurons may modulate the circuit output of underlying excitatory neuron populations and thus contribute significantly to the function of these structures. In particular, layer 1 interneurons are in prime position to regulate the firing of neurons throughout the upper layers of the cerebral cortex given their extensive connectivity to the superficial and deep layers of cortical columns15,16. In a similar manner, horizontal interneurons receive excitatory input from cortical and retinal fibers, project over a relatively wide area and are speculated to mediate inhibition of neuronal populations responding to remote visual stimuli17,18. Also, their morphology is well-suited to play a potential role in the patterned wave activity in the developing visual system19. Interestingly, interneuron development and maturation happens to a large degree postnatally. Further, this maturation process has been found to be regulated by neuronal activity and is therefore a substrate of developmental plasticity with lifelong consequences on circuit function20,21. Notably, no promoters are described which can specifically target these cells transgenically. Dividing progenitors can be targeted with retrovirus7 but virus production is time consuming and requires skill to yield the high titers needed for cell transduction. Electroporation has led to a renaissance in the study of neurodevelopment as it allows for rapid and efficient genetic interrogation of signaling pathways in neural progenitors4,22,23. Electroporation involves the injection of plasmid DNA, followed by the delivery of electric pulses to the outside of the head, to unidirectionally drive the DNA into the proliferating progenitors surrounding the ventricles4,22,23. Electroporation appears to require transit of cells through M phase of the cell cycle for expression of plasmid transgenes24. Specifically, it has been found that only cells passing through M phase within 8 hr of electroporation of plasmids will express transgenes despite their effective delivery to all cells within ~160 µm of the ventricular wall24. It is speculated that this is due to the need for nuclear envelope breakdown in allowing for nuclear access of the episomal plasmids, as chemicals causing nuclear permeabilization can induce expression of plasmids in post mitotic cells25. Originally employed in the embryo22, electroporation was adapted for use in the postnatal brain much later26,27. Recently, we have adapted electroporation for use in the genetic manipulation of pial surface progenitors6. Further, using this approach we have shown that there are apparently two distinct lineages of progenitors in this region—interneuronal and astrocytic6. This protocol details a simple, rapid, and powerful way to target these cells for the interrogation of the mechanisms regulating development of these cells. This procedure is in accordance with Cedars-Sinai IACUC requirements. Investigators should ensure institutional IACUC compliance prior to proceeding. All tools and reagents should be sterilized prior to use. Insert 100-mm fire polished borosilicate glass capillary tubes into a micropipette puller. Set heating to allow for standard weighted pull to form pipette tip of approximately 17.5 mm. Cut tips with sharp surgical scissors at a distance approximately 8-9 mm from the beginning of the tip to create roughly a 100 µm diameter opening. Make a stock 1% w/v fast green solution by mixing filtered nuclease-free water (utilizing a 20-μm syringe filter) with dry fast green. Isolate purified endotoxin-free plasmid DNA that is highly concentrated (i.e. > 3 μg/μl), diluted in Tris-EDTA (TE) buffer. Add desired amounts of plasmid to mixture diluted in TE buffer and add a 1:10 ratio of the 1% fast green solution (making a 0.1% w/v final concentration of fast green). Use a 0.5-2.0 µg/µl final concentration of plasmid for robust expression of transgenes. Induce hypothermia anesthesia on 1-2 day postnatal mice by placing them on a Petri dish that is placed on ice for 5-8 min (time dependent on pup age/weight). Once hypothermia is confirmed by lack of movement from toe-pinching and/or tail reflex, mice are ready to be injected. Place animals back on ice if pain reflexes are evident. The injection procedure and electroporation take less than 2-3 min in total so time the hypothermia, injection, and electroporation procedures accordingly to maintain appropriate anesthesia. During anesthesia, using a standard pipette, carefully pipette desired amount of plasmid mix to be injected (0.5-2 μl) onto a piece of paraffin wax film for reference. Here, a total volume of 0.5 µl of plasmid mix is injected. Next, using a micro injector, carefully insert assembled glass capillary pipette into tube containing plasmid mixture. Take extra precaution to prevent the tip from breaking by making sure it does not touch the edges of the tube. Aspirate the solution into the pipette by slowly dialing back the transfer dial. Once a sufficient volume has been loaded into the pipette, dial forward until the pressure returns to the neutral position of 0 hPa. Using 300-450 hPa pressure for injection to ensure appropriate pressure for even filling of the pial surface/meningeal space, place the tip nearby the pipetted paraffin wax film reference injection (from 2.2) and use the foot pedal from the micro injector to eject one volume onto the paraffin wax film. Adjust pressure accordingly until the amount ejected equals the previously pipetted reference volume. Once the tip has been equilibrated and anesthesia has been confirmed, pups are ready to be injected. The goal of the experiment is to inject the plasmid mix under the skull and above the pial surface to allow for DNA electroporation downwards into the pial surface progenitors (Figure 1A). For cortex injections, hold the pup down using the thumb and index finger of the less dominant hand. The cortical hemispheres and other superficial structures such as the superior colliculi are visible between P0 and P2, allowing for facile targeting of these structures (Figure 1B). Using the dominant hand and target desired region of cortex (i.e. motor, somatosensory, etc. ), insert pipette past the skin and skull taking care to avoid cerebral arteries. Make sure to prevent any further penetration of the tip past the skull (which is indicated by the lack of further resistance just after piercing the skull). Inject plasmid solution using the foot pedal of the micro injector and make sure it disperses evenly across the tissue (Figure 2A). Note: It is very important to empirically determine an approach that maximizes plasmid delivery while avoiding hematoma due to fluid pressure. This can be done by adjusting the duration of the injection, the angle, the volume, and the precise target site to avoid vascular disruption. Be sure to try and keep the tip from drying in between injections by placing the tip in test droplets from injections made previously on wax paper or plastic paraffin film. This is required to prevent tip accumulation of evaporated and crystalized DNA solution, which can result in the clogging of the tip and inconsistent delivery volumes. Set the Electroporator to 135-150 V for five pulses, lasting 50 msec, with 950 msec intervals in between each pulse. In order to increase conductance and prevent burning of the skin, cover 3-mm platinum tweezertrodes with electroporation gel. Check for toe-pinching and tail reflexes at this point to ensure anesthesia. If responsive, place on ice for several minutes to anesthetize. For cortex (and superior colliculus) injections, employ a 3-mm electrode (Figure 2B) to increase viability of pups (as compared with the 7- and 10-mm electrodes, which are used for ventricular zone electroporation). Place the negatively charged probe of the electrode over the injected area and the positively charged probe around the contralateral region below the eye such that the electrode orientation is at a 45-60° angle relative to the midline (Figure 2C). Use the foot pedal of the electroporator to trigger current and hold tweezertrodes in place for 3-5 pulses, depending on pup age and weight, effectively targeting DNA into underlying pial surface cells when accounting for curvature of the hemispheres. Note: The negative pole can be swept over the injection area in between pulses or a larger electrode can be employed to increase the electroporated area. Immediately after electroporation, carefully clean off gel from pups and place them under a heat lamp for approximately 5 min. Pups will acutely lose their natural reddish-pink hue in the minutes after electroporation due to cyanosis. Observe the pups for the recovery of natural color and the initiation of normal movement before returning them to their cages. Ensure re-socialization with the mother by observing whether she brings the pups back to the nest and begins grooming them. If she becomes aggressive, make sure pups don't have remnants of gel and incubate them with some of the bedding to transfer the smell to the pups. Inject the superior colliculus in the same fashion as the cortex but note that the target region lies just posterior and lateral to lambda and roughly at the midline (Figures 3A and 3B). With successful injections, the plasmid mix naturally fills the contours of the superior colliculus. Once injections have been made successfully, animals are ready for electroporation. In a very similar fashion, for superior colliculus injections, place the negatively charged probe of the electrode over the injected area and the positively charged probe around the eye, snout or chin, driving DNA into the superficial regions of the superior colliculus (Figure 3C). In this case, the electrode orientation is at a 25-40° angle relative to the midline. Pial surface electroporation results in the expression of plasmid DNA in cells—mostly progenitors—at or near the pial surface6. More specifically, the orientation of the electrodes is critical in dictating the direction of plasmid movement and subsequent expression. Thus, in dual electrode configurations, the plasmid is directed in roughly a straight vector between the negative and positive electrode. Therefore, if the negative pole is placed over the injection site and the positive pole is ventral to the negative pole, plasmid will be forced into the pial surface. It is assumed that orienting the electrodes to produce current vectors perpendicular to the surface would be most ideal. With appropriate electrode orientation and the use of smaller, more focally-targeted electrodes, survival is 100%. 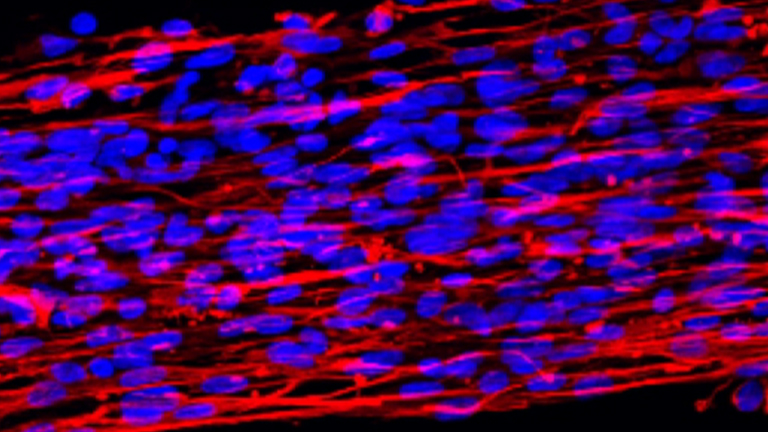 However, in some regions, such as the midbrain, care has to be taken to avoid current delivery that may stop the heart, and thus cause reduced viability of electroporated mouse pups. Newly-described tri-electrode configurations or other modifications may aid in targeting more difficult regions by avoiding structures involved in vital functions such as heart rate28. It is important to watch pups for proper re-warming to their natural body temperature, which is apparent by movement and color. When they return to color, they can be placed back in the nest. Mothers from CD1 strain of mice that we most frequently employ immediately begin nurturing the returned pups. However, other strains can be more variable, becoming aggressive or neglectful. Transferring the smell of the bedding to the pups typically prevents these issues. In strains where neglect or aggression are severe, fostering pups to mothers from the CD1 strain is the best solution. Labeled cells are typically observed many months after electroporation6. However, as with any electroporation method, plasmid DNA dilutes with cell division29. The same degree of plasmid dilution seen in fast cycling populations (e.g. SVZ progenitors) is not observed in our pial surface population, suggesting less proliferation6. However, we now employ recently-described transposition technologies (e.g. piggyBac) to mitigate this dilution problem altogether by allowing for stable insertion of transposons into the genomic DNA29,30. Alternatively, Cre Recombinase-expressing plasmids could be electroporated into Cre reporter mice to mediate stable genetic tracing of these cells31. Our initial results have suggested that the majority of our cells are mitotic at the time of electroporation6, in keeping with data described in the embryonic CNS—specifically, that electroporation labels a set of proliferating cells between S and M phases of the cell cycle24. However, further investigation is needed to define the identity and lineages of electroporated cells at the pial surface as well as to definitively ascertain their proliferative character as there are many example of spurious chemical and genetic labeling of cells in the literature4. Moreover, we have noted local injection site hematoma—especially in the cortex—when care is not taken to deliver small volumes or when appropriate precautions to avoid vascular disruption are not followed. Our previous characterization indicates at least two lineages of cells--astrocytic precursors and interneuron progenitors6. Astrocytes tend to remain at the pial surface (Figure 4A) and each cell forms a dense cloud of peripheral astrocytic processes6. Interneurons mostly remain at the pial surface but some cells can be found in almost all cortical layers or deeper in the superior colliculus6. These neurons exhibit extensive dendrites, which can be as long as several hundred microns (Figure 4B). We have not observed evidence for the labeling of oligodendrocytes or excitatory neurons in the cortex6. The majority of electroporated cells appear to have passed through mitosis in close temporal proximity to the EP procedure cortex6. Specifically, electroporated EGFP+ cells are double-labeled with the DNA replication marker BrdU when pulsed 2 hr prior with this thymidine analogue (Figures 4C-4C3). However, it is important to note that we have seen evidence of pericytic and/or endothelial cell labeling in these regions6. Figure 1. Electroporation of the neonatal pial surface (A) Coronal section schematic showing the region of the cortex that is targeted upon injection. Cells displayed along the layers of the cortex are examples of actual observed mixed populations of electroporated cells, including interneuronal progenitors and astrocystic precursors. (B) Image of a postnatal day 2 mouse prior to injection, outlining the regions of pial surface interest, the cortex (Ctx) and superior colliculus (SC). Figure 2. Postnatal electroporation of the superficial cortex (A) Example injection of the dorsal cortex after targeting the midpoint between the eye and lambda, prior to electroporation. (B) Depending on the age of pups and region of interest, flexibility varied sizes of platinum tweezertrodes can be used for electroporation (3-mm, 7-mm, and 9-mm). 3-mm diameter electrodes are typically used for pial surface electroporation (see text for discussion). (C) Electroporation of the cortex. Note the placement of the tweezertrodes, placing the positive probe below the eye, allow current to be driven to the ventral side. Figure 3. Superior colliculus targeted postnatal electroporation (A) Injection of a 2-day old pup in the superior colliculus, showing the manual restraint of the anesthetized pup and the placement of the pipette tip just beyond the skull. (B) Injection showing the dispersed plasmid DNA solution in the region of the superior colliculus (SC). (C) Placement of the tweezertrodes for electroporation of the SC, driving DNA towards the dorsal surface of the SC at the injection site. Please click here to view a larger version of this figure. Figure 4. 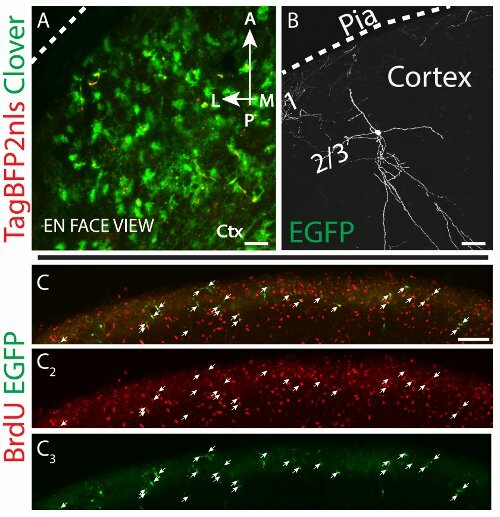 Superior colliculus targeted postnatal electroporation (A) En face, maximum projection of confocal image stacks from dorsolateral cortex ~2 weeks after electroporation of control fluorescent reporter plasmids expressing membrane-tagged Clover32 (green) and TagBFP233 nuclear protein (blue fluorescence pseudocolored red). (B) Coronal section of a cortical interneuron roughly two months post-electroporation, displaying extensive dendrites. Scale bars measure 100 μm in (A, C) and 40 μm in (B). (C-C3) Sagittal section of the pial surface of the superior colliculus demonstrating that the majority of EGFP+ cells are labeled by a single pulse of BrdU 2 hr prior to the electroporation. The most critical aspect for successful electroporation of pial surface progenitors are: 1) targeting of plasmid mix to the pial surface; 2) avoiding the generation of hematomas at the injection site; and 3) avoiding mortality associated with midbrain electroporation. Appropriately targeting the pial surface is accomplished by measured and careful puncturing of the skull to avoid penetration of the pial surface. Improper targeting to the overlying skin or underlying ventricle or brain parenchyma will be evidenced by: 1) displacement of the fast green dye with the skin upon gently rubbing the tissue (i.e. the fast green is localized above the skull in the skin and connective tissue) or 2) by disappearance of the fast green dye into the brain, indicating that the plasmid mix has gone into the ventricle and/or parenchyma. Proper pial surface localization of the plasmid mix will be evidenced by dye accumulation under the skull that cannot be disturbed by gentle skin displacement. Nevertheless, practice and dexterity is required for this successful targeting. Hematoma formation is likely caused by disruption of the vasculature by plasmid injection. Blood clots will be observed at the site of injection in the days and weeks following electroporation when the tissue is collected. To avoid hematomas, adjust the pulse length of the fluid injection and/or take note of the general pattern of cerebral vasculature to avoid vessel disruption. In general, the superior colliculus is less susceptible to clotting. Death due to electric current delivered by the tweezertrodes is easily avoided by using 3 mm tweezertrodes to more focally deliver current and by directing the electrodes away from the ventral midbrain as demonstrated (Figures 2C and 3C). A chief shortcoming of the technique is that the targeted area is limited by the size of the plasmid solution spread and the size of the electrodes. A delivery of 0.5 µl of plasmid generates an area of roughly 3 mm and, thus, is well-matched to the 3 mm electrode size. Whichever measure is smaller (solution spread area or electrode paddle area) will dictate the final size of the patch of electroporated cells. Also, only a subset of cells are labeled due to the need for mitosis for transgene expression24. However, this is advantageous for studying stem or progenitor populations and cell differentiation. Pial surface electroporation is a method allowing for the robust genetic manipulation of pial surface progenitors and their descendants. This technique is rapid, simple, and efficient, providing a more specific and easier means of targeting these cells when compared with the only other comparable approach—retroviral transduction. High titer viral production takes skill, weeks of time, and poses safety risks - especially in the case of pantropic pseudotyped retrovirus. Moreover, electroporation is somewhat more flexible as it does not require viral cloning and production. Any eukaryotic expression vector can be employed, including viral plasmids. Further, maxiprep-ed plasmids can be mixed and matched for easy co-electroporation. Typically, there is a ~90-95% co-expression for any two given plasmids with similar promoters. In should be noted that while we have only employed this targeting technique in the cortex and superior colliculus, the method should be amenable to most pial or superficial regions of the CNS provided that there is space for the local accumulation of plasmid DNA prior to current delivery. Electroporation by nature tends to favor the transduction of mitotic cells24. Thus, electroporation of adult animals should be feasible but would likely result in many fewer cells expressing transgenes due to reduced proliferative activity with aging. However, as recently detailed by Jaubodin and colleagues, the targeting of postmitotic cells in this region might be possible by employing trans-cyclohexane-1,2- diol, which allows for nuclear plasmid access by permeablilizing the nuclear envelope25. Also, electroporation is very much compatible with Cre technologies or other engineered mouse types31. Finally, transposon technology will allow for stable somatic transgenesis of this population29, 30. Altogether, pial surface electroporation represents an outstanding and flexible tool for the genetic manipulation of these unique progenitor domains. The authors would like to acknowledge support from the Samuel Oschin Comprehensive Cancer Institute Cancer Research Forum Award as well as funds from the Regenerative Medicine Institute of Cedars-Sinai, and the Guerin Family. The project described was supported in the form of a CTSI Core Voucher funded by the National Center for Research Resources, Grant UL1RR033176, and is now at the National Center for Advancing Translational Sciences, Grant UL1TR000124. The content is solely the responsibility of the authors and does not necessarily represent the official views of the NIH. Breunig, J. J., Haydar, T. F., Rakic, P. Neural stem cells: historical perspective and future prospects. Neuron. 70, (4), 614-625 (2011). Gage, F. H. Mammalian neural stem cells. Science. 287, (5457), (2000). Breunig, J. J., Arellano, J. I., Macklis, J. D., Rakic, P. Everything that glitters isn't gold: a critical review of postnatal neural precursor analyses. Cell Stem Cell. 1, (6), 612-627 (2007). Costa, M. R., Kessaris, N., Richardson, W. D., Gotz, M., Hedin-Pereira, C. The marginal zone/layer I as a novel niche for neurogenesis and gliogenesis in developing cerebral cortex. J Neurosci. 27, (42), 11376-11388 (2007). Breunig, J. J., et al. Rapid genetic targeting of pial surface neural progenitors and immature neurons by neonatal electroporation. Neural Dev. 7, (2012). Ohira, K., et al. Ischemia-induced neurogenesis of neocortical layer 1 progenitor cells. Nat Neurosci. 13, (2), 173-179 (2010). Bystron, I., Blakemore, C., Rakic, P. Development of the human cerebral cortex: Boulder Committee revisited. Nat Rev Neurosci. 9, (2), 110-122 (2008). Schmechel, D. E., Rakic, P. A Golgi study of radial glial cells in developing monkey telencephalon: morphogenesis and transformation into astrocytes. Anat Embryol (Berl. 156, (2), 115-152 (1979). Halfter, W., Dong, S., Yip, Y. P., Willem, M., Mayer, U. A critical function of the pial basement membrane in cortical histogenesis. J Neurosci. 22, (14), 6029-6040 (2002). Bystron, I., Rakic, P., Molnar, Z., Blakemore, C. The first neurons of the human cerebral cortex. Nat Neurosci. 9, (7), 880-886 (2006). Tanaka, D. H., Maekawa, K., Yanagawa, Y., Obata, K., Murakami, F. Multidirectional and multizonal tangential migration of GABAergic interneurons in the developing cerebral cortex. Development. 133, (11), 2167-2176 (2006). Ang Jr, E. S., Haydar, T. F., Gluncic, V., Rakic, P. Four-dimensional migratory coordinates of GABAergic interneurons in the developing mouse cortex. J Neurosci. 23, (13), 5805-5815 (2003). Tamamaki, N., Fujimori, K. E., Takauji, R. Origin and route of tangentially migrating neurons in the developing neocortical intermediate zone. J Neurosci. 17, (21), 8313-8323 (1997). Larkum, M. E. The yin and yang of cortical layer 1. Nat Neurosci. 16, (2), 114-115 (2013). Jiang, X., Wang, G., Lee, A. J., Stornetta, R. L., Zhu, J. J. The organization of two new cortical interneuronal circuits. Nat Neurosci. 16, (2), 210-218 (2013). Endo, T., Isa, T. Functionally different AMPA-type glutamate receptors in morphologically identified neurons in rat superficial superior colliculus. Neuroscience. 108, (1), 129-141 (2001). Schmidt, M., Ozen Boller, M., G,, Hall, W. C. Disinhibition in rat superior colliculus mediated by GABAc receptors. J Neurosci. 21, (2), 691-699 (2001). Ackman, J. B., Burbridge, T. J., Crair, M. C. Retinal waves coordinate patterned activity throughout the developing visual system. Nature. 490, (7419), 219-225 (2012). De Marco Garcia, N. V., Karayannis, T., Fishell, G. Neuronal activity is required for the development of specific cortical interneuron subtypes. Nature. 472, (7343), 351-355 (2011). Boller, M., Schmidt, M. Postnatal maturation of GABA(A) and GABA(C) receptor function in the mammalian superior colliculus. Eur J Neurosci. 14, (8), 1185-1193 (2001). Saito, T., Nakatsuji, N. Efficient gene transfer into the embryonic mouse brain using in vivo electroporation. Dev Biol. 240, (1), 237-246 (2001). De Vry, J., et al. In vivo electroporation of the central nervous system: a non-viral approach for targeted gene delivery. Prog Neurobiol. 92, (3), 227-244 (2010). Stancik, E. K., Navarro-Quiroga, I., Sellke, R., Haydar, T. F. Heterogeneity in ventricular zone neural precursors contributes to neuronal fate diversity in the postnatal neocortex. J Neurosci. 30, (20), 7028-7036 (2010). De la Rossa, A., et al. In vivo reprogramming of circuit connectivity in postmitotic neocortical neurons. Nat Neurosci. 16, (2), 193-200 (2013). Boutin, C., Diestel, S., Desoeuvre, A., Tiveron, M. C., Cremer, H. Efficient in vivo electroporation of the postnatal rodent forebrain. PLoS One. 3, (4), (2008). Chesler, A. T., Le Pichon, C. E., Brann, J. H., Araneda, R. C., Zou, D. J., Firestein, S. Selective gene expression by postnatal electroporation during olfactory interneuron nurogenesis. PLoS One. 3, (1), (2008). dal Maschio, M., et al. High-performance and site-directed in utero electroporation by a triple-electrode probe. Nat Commun. 3, (2012). Chen, F., LoTurco, J. A method for stable transgenesis of radial glia lineage in rat neocortex by piggyBac mediated transposition. J Neurosci Methods. 207, (2), 172-180 (2012). Feliciano, D. M., Lafourcade, C. A., Bordey, A. Neonatal subventricular zone electroporation. J Vis Exp. (2013). Lam, A. J., et al. Improving FRET dynamic range with bright green and red fluorescent proteins. Nat Methods. 9, (10), 1005-1012 (2012). Subach, O. M., Cranfill, P. J., Davidson, M. W., Verkhusha, V. V. An enhanced monomeric blue fluorescent protein with the high chemical stability of the chromophore. PLoS One. 6, (12), (2011).